The old fashioned potato cake recipes come from an elderly Pennsylvania German housewife who once lived in Bucks County a century ago. 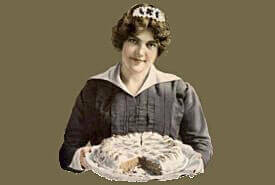 A lady who knew how to bake and was willing to share her methods. When it's a homemade dessert cake made from scratch, you know it's going to be delicious. And there's an uplifting story attached to the old time recipe too. You'll enjoy reading it and reflecting on life in gentler times. 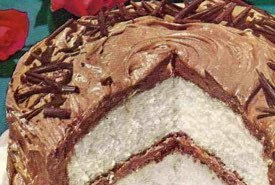 This recipe was given Mary by an old "Bucks County" cook, noted for the excellence of her raised cakes. Cream the sugar, butter, and eggs together. Add mashed potatoes, milk and cup of water containing yeast, alternately with the flour, until about 7 cups of flour have been used, making a dough as stiff as can be stirred with a spoon. Stand, covered, in a warm place by the range until morning. These should be set to rise about nine o'clock in the evening. 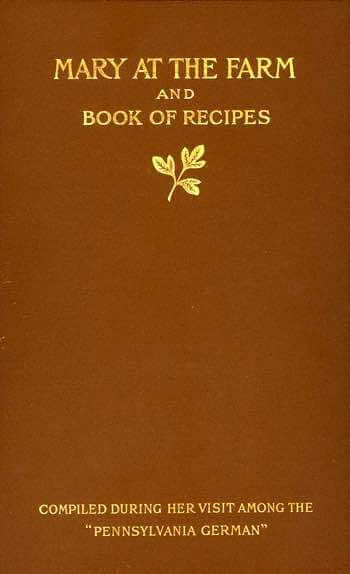 The following morning, take pieces of the dough, on a well-floured bake board; roll about one inch thick, to fit in pie tins, place in pie tins to raise; when doubled in bulk spread with melted butter and sprinkle sugar thickly over top and bake in a moderately hot oven until lightly browned on top. This quantity of dough makes six cakes. Instead of brushing the cakes with above mixture, place in a bowl 1/2 cup of soft A sugar, 1/2 cup flour, a tiny pinch of salt and baking powder each and 2 tablespoonfuls of butter (not melted), mix all together as crumbly as possible, then the crumbs were sprinkled thickly over tops of cakes, which had been brushed with a mixture of milk and sugar. Place cakes in oven when raised; bake 20 minutes. Then, one teaspoonful of baking powder sifted with one cup of flour added to the batter alternately with the stiffly beaten whites of eggs. Bake in two layers, in a moderately hot oven. Ice top and put layers together with white icing. This is a delicious, if rather unusual cake. In the early part of September Mary's Aunt suggested she try to win the prize offered at the Farmers' Picnic in a nearby town for the best "Raised Potato Cake." Aunt Sarah's rye bread invariably captured first prize, and she proposed sending both bread and cake with Sibylla and Jake, who never missed picnic or fair within a radius of one hundred miles. Mary set a sponge the evening of the day preceding that of the picnic, using the Perfection Potato Cake Recipe, which Aunt Sarah (see photo at right) considered her best recipe for raised cakes, as it was one used by her mother for many years. 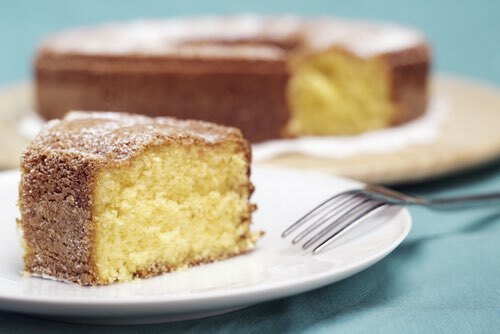 On the day of the picnic, Mary arose at five o'clock, and while her Aunt was busily engaged setting sponge for her loaf of rye bread, Mary kneaded down the "potato cake" sponge, set to rise the previous evening, now rounded over top of bowl and light as a feather. She placed a piece of the raised dough on a large, well-floured bake board, rolled it over and over with both hands until a long, narrow roll or strip was formed about the width of two fingers in thickness and placed this strip carefully on the baking sheet, which was similar to the one on which Aunt Sarah baked rye bread; shaped the dough to form a figure eight (8) or pretzel, allowing about two inches of space on either side of baking sheet to allow for raising. She then cut a piece of dough into three portions, rolled each as thick as a finger, braided or plaited the three strips together and placed carefully on top of the figure eight, or pretzel, not meeting by a space of about two inches. This braided piece on the top should not be quite as thick as bottom or first piece of the pretzel. She then rolled three small pieces of dough into tiny strips or rolls the size of small lead pencils, wound them round and round and round into small scrolls, moistened the lower side with water to cause them to adhere, and placed them on the dividing line between the two halves of the figure eight. She placed an old china coffee cup without a handle, buttered on outside, in center of each half of the figure eight, which kept the pretzel from spreading over the pan. With a small, new paint brush she brushed over the top of Pretzel and Buns, a mixture, consisting of one yolk of egg, an equal quantity of cream or milk (which should be lukewarm so as not to chill the raised dough) and one tablespoon of sugar. This causes the cakes, etc., to be a rich brown when baked, a result to be obtained in no other manner. When the pretzel was raised and had doubled in size 'twas baked in a moderately hot oven. Mary's surprise and delight may easily be imagined when Sibylla, on her return from the picnic, handed her the prize she had won, a two-pound box of chocolates, remarking, "Mary, you and Aunt Sarah both got a prize — her's is in the box what Jake's got." The box on being opened by Aunt Sarah contained a very pretty, silver-plated soup ladle, the prize offered for the best loaf of rye bread. Authentic Pennsylvania German recipes such as these have been treasured by generations of good cooks. And now you get to try your hand at making a prize winning cake. It's hard to believe that something so tasty can be made from ordinary mashed potatoes! You just have to try it. The old fashioned raised potato cake recipe is somewhat time-consuming to make, though it's a fun experiment to try. 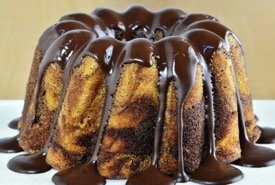 If you haven't the patience and would still like to sample a potato cake made with mashed potatoes, try the quicker, more easily made chocolate potato cake recipe above that calls for baking powder instead of yeast. "Pans of the whitest, flakiest rolls, a large loaf of sweetest nut-brown, freshly baked graham bread; an array of crumb cakes and pies of every description covered the well-scrubbed table in the summer kitchen, situated a short distance from the house. "A large, yellow earthenware bowl on the table contained a roll of rich, creamy smier kase [cottage cheese] just as it had been turned from the muslin bag, from which the whey had dripped overnight; ready to be mixed with cream for the supper table. Pats of sweet, freshly-churned butter, buried in clover blossoms, were cooling in the old spring-house near by." 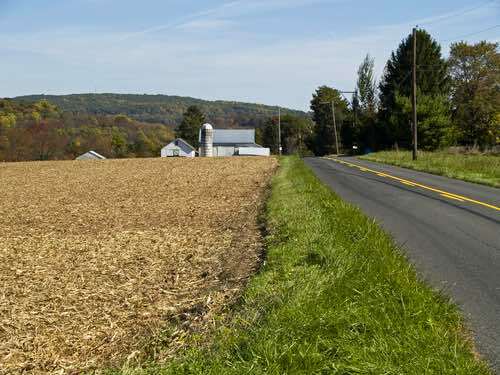 The perfect setting for great tasting Pennsylvania German desserts!